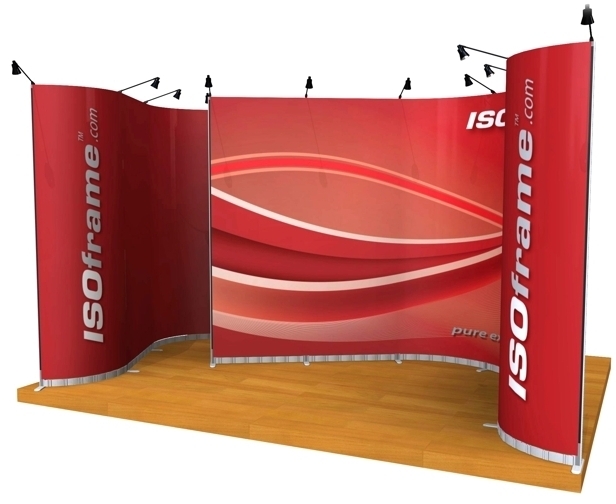 The Isoframe Wave modular exhibition system has a stunning curved look, with infinite flexibility and is very easy to install. 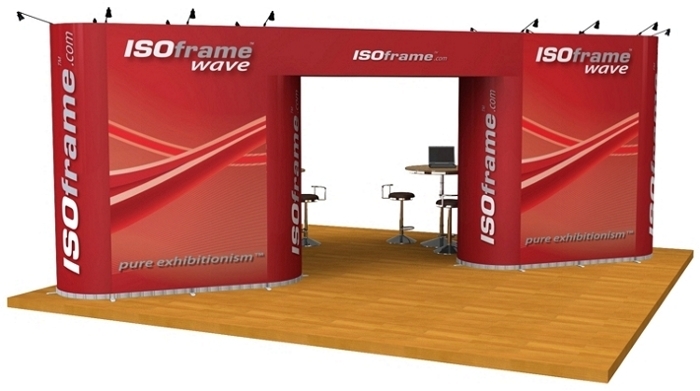 The Isoframe Wave system is flexible enough to create curved shapes and straight runs, producing the stand design you need with a simple tool-less assembly, which makes the Isoframe Wave display the perfect, reusable system for use within shell schemes, trade show booths or on space only exhibitions stands. 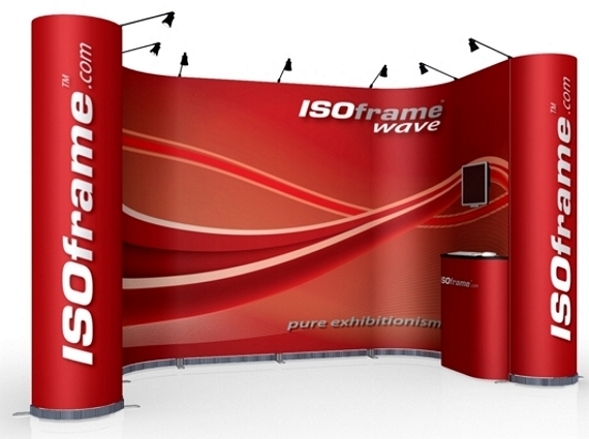 Isoframe Wave display stands can be re-used, re-shaped, re-imagined and re-sized to create alternative layouts using the same framework and flexible panel graphics (all graphics are 800 mm wide), unlike more traditional pop ups and banner systems. 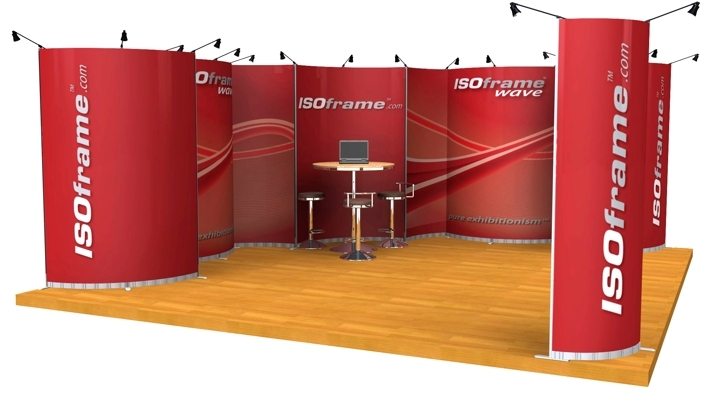 Beginning with the starter kit, additional beams or links and uprights can be added to create the look and feel of your exhibition display. 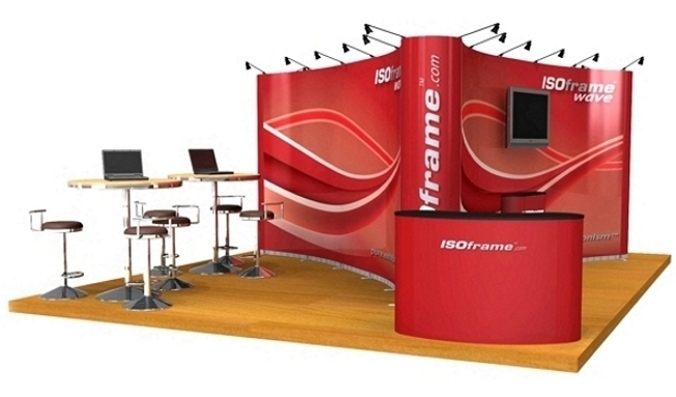 Straight beams for shelving, table attachments and screens can also be added. 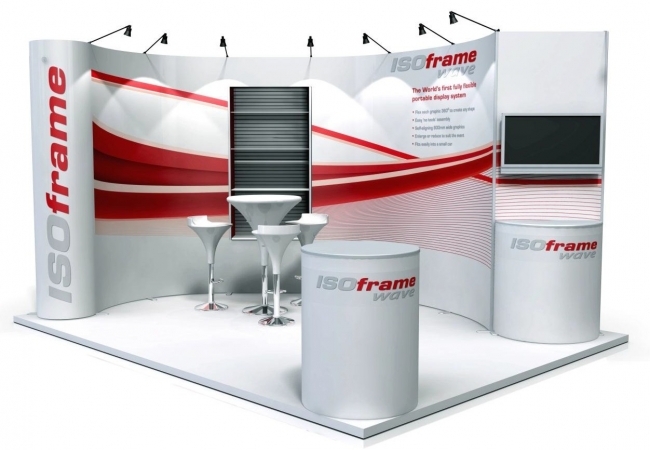 The system Flexi-link creates a strong and stable framework that allows every graphic panel to be individually shaped, each panel can be flexed upto 180 degrees on the horizontal plain. The graphics system is completely modular, using a tool less assembly method, and can be packed away into cases which will fit into the boot of a car. Graphics are automatically aligned magnetically (which gives a perfect fit, without any curling of the edges) using the i-line intelligent graphic alignment system, which has an in-built levelling method for uneven floors. 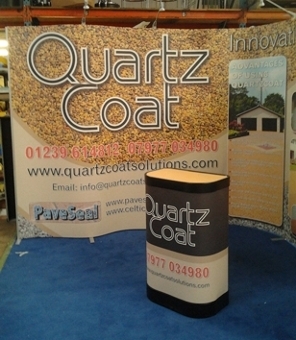 Both the above examples of the system have been constructed from the same framework and graphics as the main image, giving two new exhibition stand designs. 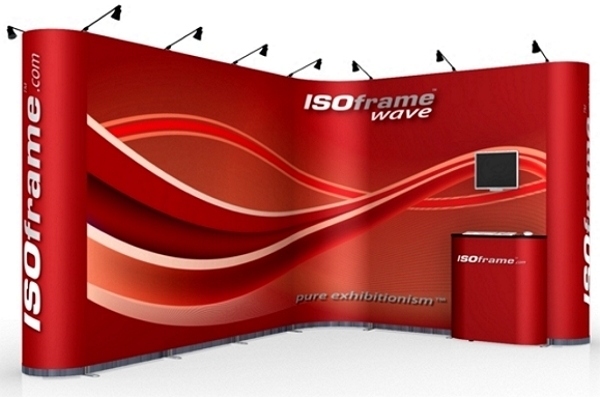 The infinite possibilities of re-design make the "Wave" a very versatile interior exhibition display system. 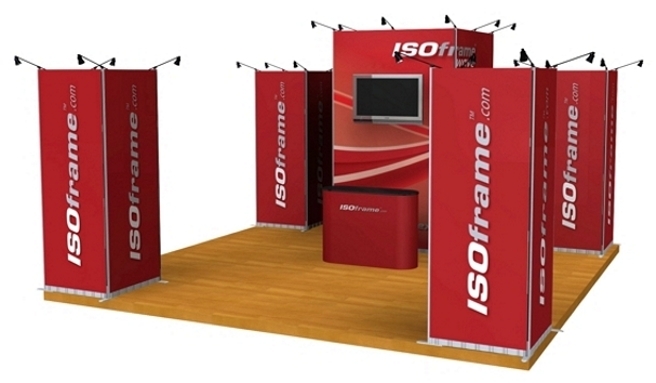 Isoframe displays are easy to assemble, using the FASTclamp system, which connects the main support posts to the baseplates; push to lock, lift to release. 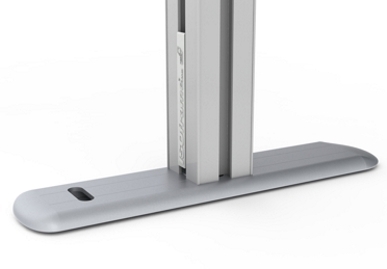 The baseplate has a second connecting point so the system can be built against walls. Installation of the "Wave" system is very easy and requires no tools, the design in the main image takes less than 15 minutes to install. 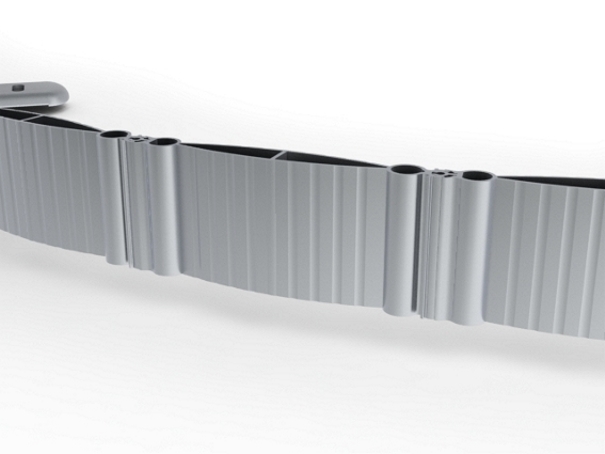 Flex the entire Isoframe Wave system to create the shape you need. 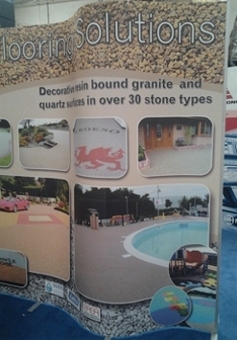 All graphics are 800 mm wide so you can interchange, add or delete sections to create the look, shape and size you require. Simple tool-less assembly means set-up is both fast and easy. Fits easily into the boot of a car. 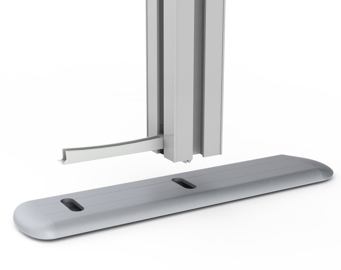 The i-line Intelligent Graphic Alignment System automatically aligns the graphics magnetically. 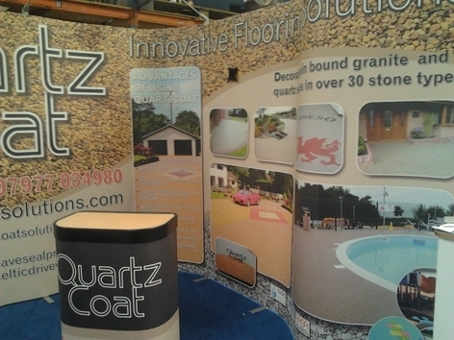 Tensionless graphics are easy to hang and never curl at the edges. 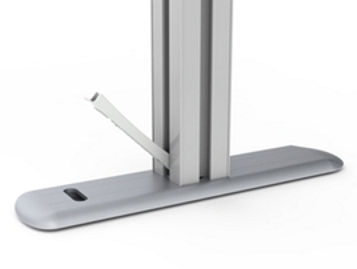 Dual position base supports give maximum stability - even close to walls. 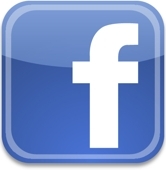 Build in heavy items such as LCD/TFT screens upto 36" (18kg). 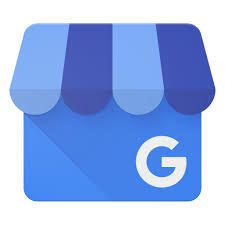 Attach tables or shelves in seconds. Perfect for shell schemes or space only venues. The Auto-float System means graphics align perfectly even if the floor is not level. 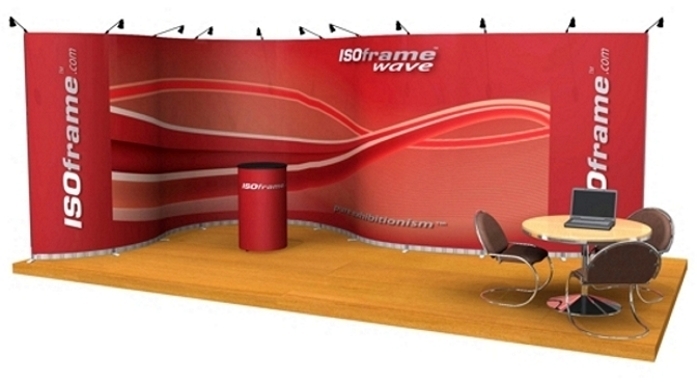 ISOframe Wave display stands are available for purchase and hire. New version now available with improved graphic "hanging" system and with flexible link element placed behind the graphic panel.